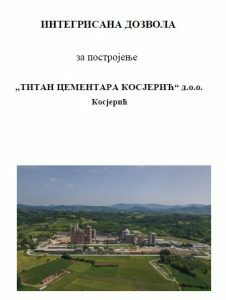 On 17 July 2018, the Ministry of Environmental Protection issued a Decision on the issuance of an Integrated Permit for the operator TITAN CEMENTARA KOSJERIĆ ltd, number 351-01-00372/2018-03 for the operation of the entire plant and performing activities of cement production at the location of the municipality of Kosjerić. The decision was made pursuant to Article 15, and in conjunction with Article 23 of the Law on Integrated Pollution Prevention and Control (“Official Gazette of RS”, No. 135/04 and 25/15).